Pangea Software today announced that all of its tvOS apps designed for the new fourth-generation Apple TV include support for 3DTVs, allowing users to play the company's games in 3D. Developer Steven Troughton-Smith shared an image of Pangea Software game Bugdom 2 in 3D on the Apple TV earlier today, after which the company confirmed in a press release that its entire lineup of apps will offer 3DTV support. 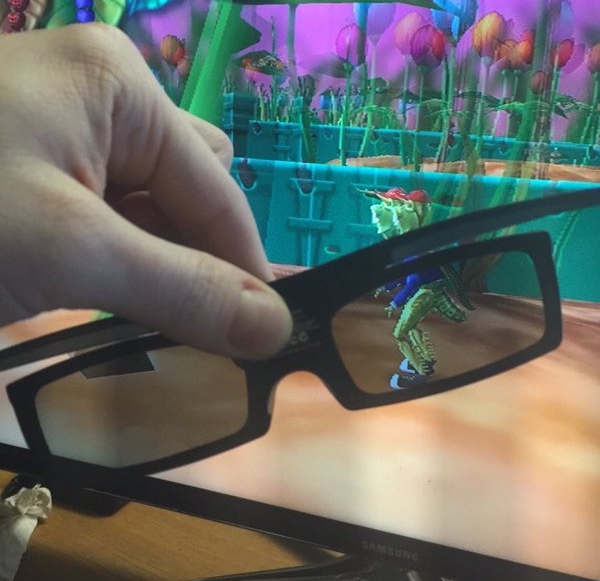 The 3DTV support is implemented using side-by-side 3D, which is a standard 3D implementation technique compatible with all 3DTVs. All of Pangea's games have the capability of playing in stereo-3D on any HDTV which is 3DTV capable. This not only adds an extra visual element to the games, but in many cases it gives the player an advantage since 3D makes it easier to aim weapons and calculate jumps. Additionally, all of the games are Game Controller compatible, so they can be played with either the Siri Remote or with any tvOS compatible Gamepad. Pangea Software offers a wide range of games in the iOS App Store that are available on tvOS as of today, including Air Wings, Nanosaur 2, Nucleus, Otto Matic, and Bugdom 2. In the future, additional games from the company will be available for the Apple TV, including Cro-Mag Rally and Air Wings Intergalactic. I'm so happy to see Pangea thriving. I remember being 14 or 15 years old and I emailed their head developer, the one that always took the stage at WWDC for demos, asking for some advice on iOS and Mac development and telling him how much I enjoyed his company's products. To my surprise he responded! He said how great it was that I was learning development and that I should keep at it. If I recall he may have even sent some source code from Cro-Mag Rally or Enigmo or something. Well I took it to heart, and am now employed as development intern at an ad agency and pursuing my CS degree! I hope to be as patient and influential as that man was when the time comes. A little encouragement and advice really goes a long way, especially when you're that young. Believe it or not I actually remember you! Good to hear you're pursuing it! I know most people don't like 3D, but I have 3D on my projector and it is fantastic. I'm looking forward to this even if just for a fun gimmick. You mean it's hard not to buy a 4k TV these days. 3D TVs died over years ago. 3D TVs are a gimmick and I'm glad it's dead. Almost all 4k TV's I've seen lately also have 3D. I've played 3D movies previously through my old AppleTV (SBS videos, via Home Sharing) and while the videos play great, any AppleTV popups/overlays/icons etc. are messed up because they aren't in the SBS format - obviously. I assume it'll be the same with these games. If you turn on 3D after the game has loaded and no other popups or notifications etc. from the OS appear, it'll be perfectly fine. If they do, they'll be nigh unreadable, you'll have to turn off 3D to view them. That is correct, however, if your 3DTV supports auto-detect mode (like my Sony does) then it will automatically switch from 3D back to 2D whenever a UIKit dialog appears, and then return to 3D when it goes back to the game. They say it's 'side-by-side', which means the Apple TV itself isn't supporting it. The stream will display the left and right eye images side-by-side and it'll be up to your TV to merge them together. Count me as one. It was cheaper than the non 3D Vizio tv so I figured why not?